These days most professional sports teams, regardless of where they are in the world, tend to dabble in limited/variant jerseys. But few go as nuts for the ideas as minor-league American teams. I’ve posted about the weird union between video games and sports jerseys before, but most of those cases were relatively straight-up commercial agreements. Sony or Capcom would sponsor a team the same way an insurance or car company would. Minor League baseball team the Frisco Roughriders, though, are throwing that out the window. 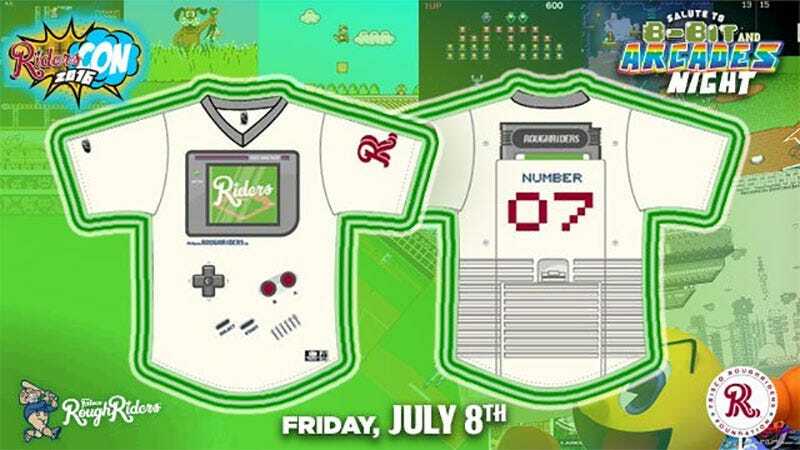 In a game on July 8, they’ll be wearing this Game Boy shirt that does not skimp on the detail, including everything from the cartridge slot on the back to the speaker grills on the front. They’re even using Mario to promote the thing. Later this year they’ll also be wearing two other 80s-inspired jerseys, one based on Top Gun, the other on Ghostbusters. I’m not as familiar with baseball as some of my American colleagues, but hoo boy, this minor league stuff looks fun. The Roughriders have a giant water park thing in their outfield where you can float down a fake river with a beer, and a cap with a cartoon Teddy Roosevelt on it. That’s my kinda pro sports.